View this Must See Client Testimonial video and see how Liz can help You with Selling or Buying your Home. Absolutely the BEST real estate experience ever. Liz is not only professional but she is detail oriented and full of energy. She gets results. I learned that the right realtor makes all the difference. Liz is the right realtor. Liz is a real professional who knows how to sell real estate. She is diligent, thoughtful and goes beyond what you expect. She is very responsive and stays on top of things throughout the process. She communicates regularly with useful information. We do not live in Arizona, but Liz made sure we were properly informed and consulted throughout. She took care of the big things and also the important little things like ensuring staging was done beautifully to her high standards. We got 100 per cent of our asking price for our investment home and she sold it in just a few days! Very impressive! You will be very pleased with her personalized service. Best part is that you get Liz and not some junior realtor who may be part of a bigger sales team. Choose Liz and know your property is in good hands. A+++. Liz is a Rock Star when it comes to selling real-estate. We had listed our condo with another realtor and it sat for nine months, with very little traffic. In less than 90 days, Liz sold our property near list price. She not only took the time to make solid recommendations to improve the overall look of our condo, but she leveraged her marketing skills and worked furiously to attract the right buyers. She is hands down a top realtor who knows the market. I highly recommend Liz without hesitation - you will not be disappointed. Liz is a true professional. After listing our house to be sold with another realtor we took the home off the market after six months. Liz then sold the home at 98% of asking price within a matter of weeks. She helped us throughout the process and even came over to the house and watched our dogs while we were at work so people could view the house. She also helped us with negotiation on the purchase of another home and was very helpful in the negotiation and throughout the purchase process of the new home. My wife and I cannot say enough good things about Liz and her abilities in the Real Estate market. If you want the best give Liz a call you will not go wrong. Thank you Liz for all help. 5/20/2016- Joe & Nubia G.
Liz listed our home in North Phoenix and it sold within 2 weeks at 98% of our list price! At our first meeting I loved her marketing strategies and plan!! The staging done prior to selling was key and the professional photos/virtual tour were unbelievably amazing!! Liz is so professional yet the most helpful, sweet, down to earth woman with every single step you can imagine. She was there for us through a crazy closing and kept in contact with me every few hours until it closed! When I think about the fact that I considered doing a For Sale By Owner instead of using a Realtor my mind is blown! Liz earned every penny she made and handled all the legal contracts, appointments, back and discussions involved during the sale with all the realtors to see the home, the buyers realtor, loan officer, Title company, photographer, inspection people, appraiser and I'm sure more people that I don't even know about!! I know that I chose the best person to sell my home! Liz also helped us find out new home which wasn't easy! She was patient, took the time to take us to many homes and helped us find the perfect home for our family!! We love the new house so much!! She's the BEST!! We are so impressed!! I plan to send my own 2 grown kids to work with her as they buyer their first homes. I know there are so many realtors but you won't be sorry if Liz Eichelberger is in your corner. She makes the sale happen!! Thank you so much Liz!! I contacted Liz about a property that she had listed and was immediately impressed by her professionalism and responsiveness to both my needs and timeline to purchase a home in my desired area. Liz took the time and interest in getting to know me as a client and always keeping my budget in mind; she worked around my work schedule and sent property's that would fit the parameters that I had. Liz and I worked together for almost two and half months she was with me every step of the way; always answering my questions and many emails during the process with great energy and always with a smile and encouragement. I would recommend Liz as an area expert and will use her again for my next home purchase in the Scottsdale area. Bought a Townhouse home in 2016 for $225K in North Scottsdale, Scottsdale, AZ. 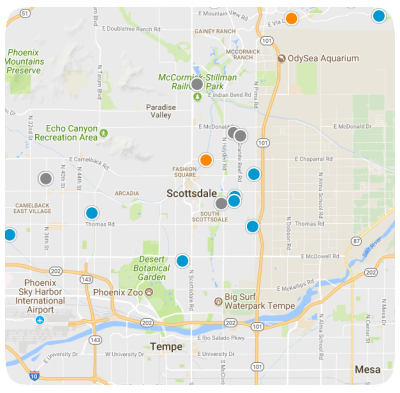 We found Liz through the Zillow site for a property in Scottsdale. After meeting with her we were extremely impressed with her professional appearance and knowledge of the Arizona real estate market. We were a relocation from Southern California and she was always willing and available to work with us when we were in town. She negotiated an amazing deal on a beautiful short term rental for us which made our transition to a new state such a positive experience. We ultimately purchased our dream home which took almost five months due to the sale of our existing home and dealing with a seller whose house was overpriced. During that period we looked at many home in many areas and she always made us a priority. Liz followed through on every aspect of the purchase from recommending an inspector to referring us to an incredible escrow service. We love our wonderful lakefront home and are happy to now call Gilbert Arizona our home. We have Liz to thank for that! Bought a Single Family home in 2015 for $525K in Val Vista Lakes, Gilbert, AZ. Liz is FABULOUS! Selecting Liz as my Realtor was the best decision I made when putting my home on the market in early November. She literally walked me through every step in the sale of my condo. We listed my condo at a very fair price in early November, Liz held two open houses, and in less that two weeks we had an offer in which Liz very successfully negotiated an acceptable price for both buyer and seller. Liz PROMPTLY returns all calls and responses to all emails. I know she will see me through closing set for early January. This is just what Liz does - unbelievable work ethics! If you want and need a realtor present and actively working for you, Liz Eichelberger should be your choice. Sold a Apartment home in 2015 in North Scottsdale, Scottsdale, AZ. To sum up our experience with Liz in one word: AMAZING! In fact, the only negative we’ve encountered was only being able to rate her 5 stars on this survey! We just closed on our first home and are over the moon with our purchase - all thanks to Liz’s quick thinking and skills. Liz has been outstanding from start to finish. She is focused, driven, timely, professional, dedicated, supportive, and has great energy that made this process less stressful and definitely fun! We feel like we’ve known Liz all our lives as she has treated us as if we were family – that’s exactly what it felt like for us. Being first time homebuyers we had lots of questions and none were ever too stupid or silly for Liz. If she didn’t have the answer she promptly got back to us with the answer when she found it. We will definitely recommend Liz to our friends and family who may be buying or selling and would absolutely use Liz if we ever needed a realtor again. We have a lifelong friend in Liz – pretty awesome since we didn’t know her before! Bought a Single Family home in 2015 for approximately $350K in Glendale, AZ. We are lucky to have Liz as our realtor to purchase a house in Arizona. She is awesome in every aspect. She knows the area very well, and responds in time to our emails and phone calls, which is very important to us since we are physically located far from Arizona. Liz also helped us negotiate a good deal. With her help, the whole process of buying a house is smooth and pleasant. We highly recommend her to you especially if you are out of state from Arizona. Bought a Single Family home in 2015 for approximately $325K in North Scottsdale, Scottsdale, AZ. Bought a home in 2015 in North Scottsdale, Scottsdale, AZ 85255. Liz is a real professional. She has the knowledge and drive to get the job done and she makes sure it is done right. Liz won’t accept anything less than the best representation for your home. It has been awhile since I have sold a house and thank goodness I had someone like Liz on my side. I also realized during the process that I have not had particularly good representation in the past. She makes you realize what having a great agent can mean. It is very important because unless you are an expert on your state’s rules and regulations, a homeowner could make a mistake that and that could be costly. I am so glad I had the good fortune to find Liz Eichelberger. I feel very lucky. There are many realtors to choose from but not many have what it takes like Liz does. I fully recommend Liz for anyone looking for a smooth real estate sales experience. Sold a Single Family home in 2015 for approximately $325K in North Scottsdale, Scottsdale, AZ. Liz was amazing. She is very knowledgeable in her suggestions to get the best results from you sale or purchase. She is fast to respond and takes quick action upon your requests. We were very pleased with the outcome of our sale and would highly recommend Liz for your listing or to find your new purchase. She has tremendous connections with lender, banks, property management companies and others that she was able to share with us. Sold a Apartment home in 2015 for approximately $250K in North Scottsdale, Scottsdale, AZ. Very friendly and reliable. Very helpful in going through the process of buying a new home. Always returned phone calls in a prompt manner. Always had your best interest in mind. Knows the area real well and worked around your schedule. Liz is phenomenal at what she does. We met Liz on a Wednesday and by Saturday same week we found our new home. Liz is on point and example of what every realtor strives to emulate. Bought a Single Family home in 2014 for approximately $300K in Bridges at Gilbert, Gilbert, AZ. Liz helped us find just the right property to rent in a very competitive market. She not only helped locate the property, she was instrumental in getting us settled in by conducting the final walk thru with the home owner. She has been very responsive and a joy to work with! Liz bent over backwards to help us through the process. She is extremely responsive and helpful. In fact, we bought our home from out of state, and Liz went above and beyond to make it easy for us, including acting on our behalf for the home inspection, service provider calls, etc. She also took us to see dozens of homes before finding the perfect one -- with a smile on her face the entire time. She is invested for the long haul. Bought a home in 2014 in Desert View, Phoenix, AZ 85331.
liz was very professional and friendly i felt very comfortable. she did everything I asked of her. she worked very hard to sell my house. her personality is amazing. she is so down to earth, And her sense of humor is out of this world i never laughed so much. she is the best. Sold a Single Family home in 2014 for approximately $400K in North Scottsdale, Scottsdale, AZ. CALL LIZ & THIS IS WHY. Buying or selling a home could be scary or the most exciting experience one could have. I've had the opportunity to work with various Realtors in the past but working with Liz Eichelberger I must say was the most pleasant, exciting, rewarding and smoothest experience of all. Whether you're buying or selling a home you want the job done right and quick. "CALL LIZ". Her professionalism, area knowledge, dependability, her expertise on all levels from start to finish she handles it all. I truly felt Liz was working for me and had my best interest at heart.I couldn't be happier in my dream home. If you want the best you call the best "LIZ". Bought a Single Family home in 2014 for approximately $350K in Paradise Valley, Scottsdale, AZ. My experience went really well with Liz. I am so glad I chose her as my real estate agent. Being a first time home buyer, she made this process painless, and at the same time kept me in the loop. She knows all the areas ( I wasn't sure where I wanted to go) and what would be best for me location and price wise. If you are looking for your 1st home or your 10th home, she's really a wonderful person to work with. You wont be disappointed! Bought a Townhouse home in 2014 for approximately $125K in Paradise Valley, Phoenix, AZ. Six weeks ago Liz help me sell my home amazing she's very professional punctual and definitely delivers high-end customer service. She sold the house in three days and to top it off it was sold at 98% of the asking price. I just wanted to say thank you Liz for an amazing job and helping me move into my future thank you again so much. Sold a home in 2013 in Finley Farms, Gilbert, AZ 85296. Liz has done a great job for me during my home purchase. She was able to provide me with updates and many home options when they became available on the market. Liz was able to negotiate to the price that I was happy with. I will be recommending Liz to my family and friends. Bought a Multi Family home in 2013 for approximately $225K in North Scottsdale, Scottsdale, AZ. I used Liz, again, but this time to sell my house. We sold it in 13 days and at 98% of the asking price! The negotiation process was super smooth and, like before, Liz was extremely responsive to my questions and concerns. Thanks Liz for being an outstanding agent and helping me once again! Highly Recommended! The review below is from 2012 when she helped me buy my house. Liz was monumental in helping me find my first home. She listened to my needs so carefully that I actually ended up buying the very first home that we looked at. We then beat out six other offers through her persistence, negotiation, and rapport building skills. Whenever I had a question she was always right there, and made the entire process very enjoyable. I would recommend Liz to anyone who was looking to buy or sell their home. Thank you Liz for helping me to find my dream home. 12/19/2012 - Matin Ghafuri PharmD. Bought a home in 2013 in Desert View, Phoenix, AZ 85331 and also helped me rent a Single Family home in Scottsdale, AZ.